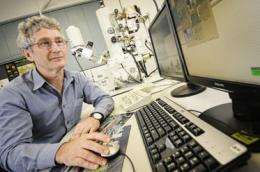 (PhysOrg.com) -- The tooth enamel of lungfish and garfish could provide the basis for new material to make lighter more efficient aircraft or vehicles, says a Queensland University of Technology (QUT) physics researcher. Professor John Barry, from QUT's Faculty of Science and Technology, is on the hunt for new materials to develop from biology that will assist and enable technological advances. "Without new materials we would never had had modern and efficient cars, for example. Compared with 60 years ago cars of today have much better handling, acceleration and braking and safety features thanks to the discovery of new materials along the way," Professor Barry said. "The impetus for my work is the need to find better new materials because the vast improvements made in materials over the past 60 years will not continue unless there is constant innovation. Limitations in the properties of current materials is beginning to matter. Because of a need for ever increasing performance, materials are being pushed to the limit which sometimes results in catastrophic failure such as occurred recently with an A380 aircraft engine. Professor Barry said the study of teeth allowed us to learn from nature. "Teeth in different animals have been adapted or 'engineered' for various purposes. As engineering materials, teeth are composite materials with properties which are much superior to any existing synthetic composite," he said. "We started with lungfish because they are an ancient animal and we thought their tooth structure would be much simpler than modern animals that have undergone many more evolutionary changes. "We were surprised to find the lungfish has a complex tooth microstructure - not simple at all. We are also studying garfish because they have hardwearing teeth and we want to know how they manage that. "Teeth are composed 95 per cent by weight of the mineral, hydroxyapatite, which on its own is very weak but when used by a living system is tough and durable." Professor Barry is studying the tooth structure at three levels to model its strength in different situations and assess potential uses as a new material. "I am looking at dentine's crystals which have various shapes and surface habits and then looking at the way the crystals are arranged in different bundles and also how the tooth surface is arranged to cut, crush or grind food," he said. "New materials have been developed that copy nature in the past. For example, engineers trying to imitate the properties of wood during World War II developed fibreglass and velcro is based on the seed burrs that stick to clothing." Professor Barry said that by copying some of the structures in teeth it should be possible to make composites which could be used more widely in cars and aircraft, for example. "At present, carbon fibre composites are the best available, and although carbon fibre composites are very strong 'along the grain' they are very weak 'across the grain' and their uses are limited," he said. "If general-use composites can be developed it will be possible to make cars and aircraft that are lighter and more fuel efficient." " "Without new materials we would never had had modern and efficient cars, for example. Compared with 60 years ago cars of today have much better handling, acceleration and braking and safety features thanks to the discovery of new materials along the way," Professor Barry said. " this guy has never heard of computers? even though he seems to be working on one. "I tried to explain it all with evolution, but I accidentally mentioned 'design'!" In order to file a patent infringement suit, you'd first have to exist.